"This Stuff" by Frankie Cosmos. "Thanks 4 Nothing" by Nilüfer Yanya. Finding My Florida - I came across this Florida story in the New York Times and thought it was an accurate and enjoyable journey through the state. There are so many worlds, great Cuban sandwiches, and lots of mossy oaks. Pizza Horoscope. - Because I exist on the cusp, looks like I need to eat a whole white pizza—"an exquisite pairing of garlic and ricotta"—with a variety of spontaneous toppings from the fridge AND a Grandma pie. Done. I crossed another Brooklyn Blackout cake off my list last week, this one from Little Cupcake Bakeshop. It looked heavenly and there was a framed plaque showing off Food & Wine's description of this particular cake as "one of the best chocolate cakes in the U.S."
I have to disagree. It was delicious, but the frosting was a far too sweet and the cake was a bit too airy. I'd still be down to try more of their baked goods. The carrot was tempting and the banana Nutella looked lovely. Dug into my storage unit and it was like going on a shopping spree. I got so excited about shoes and dresses and shirts I forgot about. I gathered several pink tees and green dresses. Pink, red, and black boots. A glorious leather fringe vest. Maybe it's to my advantage to slowly have access to my things over a span of time. I'm ready to shed the coats and sleeves. Youth fashion inspiration below. Digging the overalls and chucks. 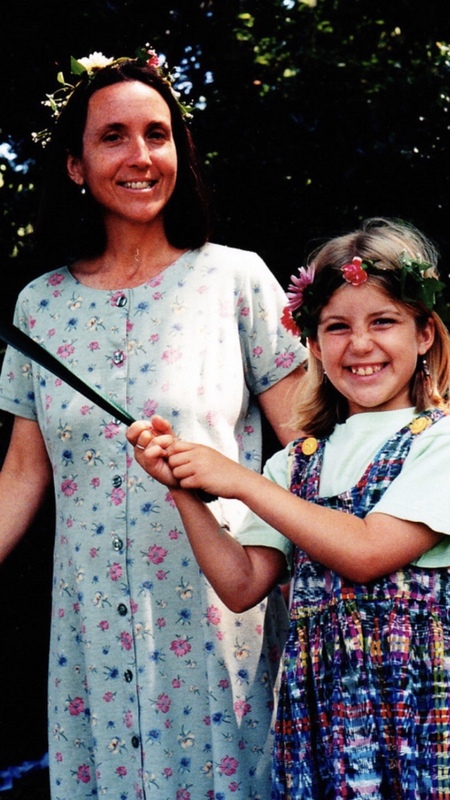 My mom and I at a May Fair is very spring-floral-forward. I want to watch Barry on HBO—Bill Hader is always wonderful. I'm ready for Westworld to return. I've been catching up with the last season of Atlanta so I can get back into the new one. I'm sad I'm done with High Maintenance and caught up with Queer Eye. I'm curious about the movie Chappaquiddick. Having lived on that island, I'm curious to see the familiar places in the film. Kate Mara, Ed Helms, and Jim Gaffigan—interesting selection for a cast. Open Windows: I love hearing the violinists and singers in my building. I love having open windows WITHOUT SCREENS because there aren't a thousand bugs ready to swarm inside. I love hanging with my family, the breeze coming in, the cats all sitting in the sunshine, and it feeling like spring is here.